A preview of the letters inside this PDF. 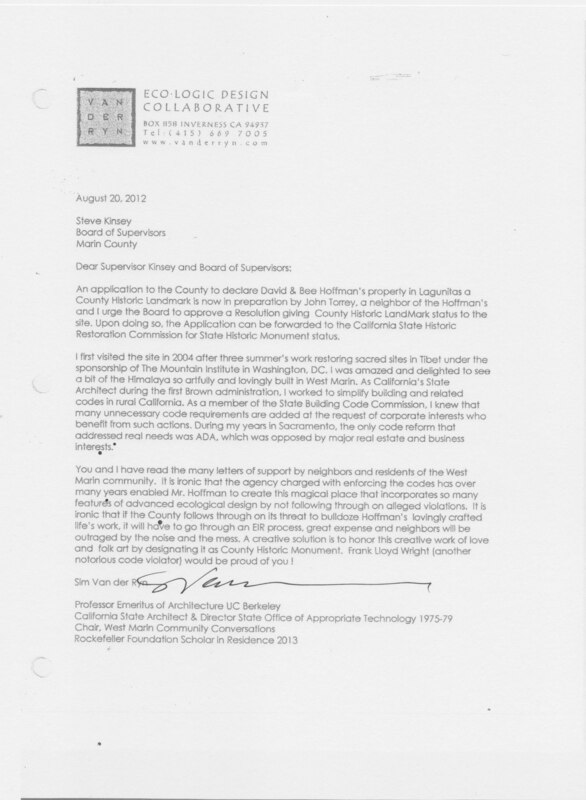 Click here to open the PDF containing these Letters of Support. 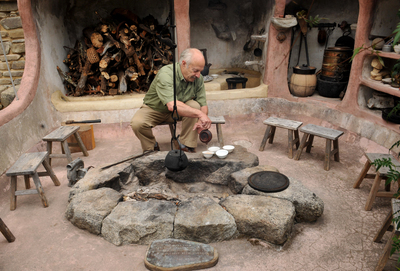 Thanks to Samantha Kimmey for her report (Aug. 13, 2015) about David Hoff- man, tea purveyor par excellence, sustainability maven and artist of the first order. We were heartened to read that the county is considering special designations for some of the buildings at Hoffman’s architectural wonder, the Last Resort, in Lagunitas. We support this decision however it is important to recognize that every stitch of the Last Resort is important to the whole. Being there one feels the uplift of being inside a great vision, coherent and, above all, useful. It’s not a far stretch to feel the embodiment of great structures that were both useful and stunning to the psyche. What Hoffman has realized in stone and wood is nothing short of the wonder of Simon Rodia’s Watts Towers in Los Angeles or the standing stones of Stonehenge—beautiful in their own right and functional as an agricultural time piece. We’ve known Hoffman some 40 years, since his arrival in the San Geronimo Val- ley, and have marveled at his energy for building and designing supreme useful- ness into the very structures crucial to our survival on planet earth. Hoffman has fashioned water systems, food systems, and waste systems that are self-sustaining. In our drought times his exemplary water works, that use grey water for his worms and garden, should be adopted as true alternatives to ameliorate our water crisis. Everything at Hoffman’s home is beautiful and beautifully useful. The Last Re- sort is a work of art. Our vote is for the county receiver to re-shape the entirety of the Last Resort into a teaching center for the beauty of sustainability—as a precious resource for now and for the future. 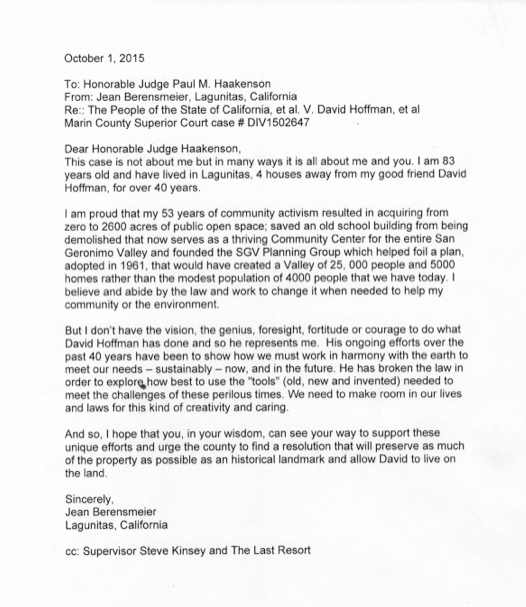 Sim Van der Ryn, an acknowledged leader in sustainable architecture pledged his support for The Last Resort in a letter to the Marin County Board of Supervisors. See the full letter here.